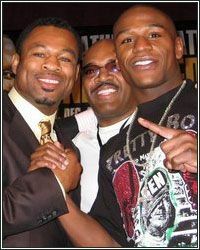 Floyd “Money” Mayweather and Sugar Shane Mosley will have their kick-off press conference today in New York City for their May 1 welterweight showdown at the MGM Grand in Las Vegas. The public is invited to attend the presser, which takes place at noon at the Nokia Theatre in Times Square. Free tickets are available through Ticketmaster.com. Tickets for the May 1 event at the MGM Grand, priced at $1,250, $1,000, $600, $300 and $150, will go on sale today at 10AM PT. There is a limit of two for the $150 seats, and a limit of ten for the other price ranges.